Are You Peacocking? : 2 coats. Inspiration: Peacocks: ice breakers and attention getters. Thoughts: This polish has a massive amount of blue, turquoise, green, pink and purple flakies make this polish sparkle like no other and will make you want to strut like a peacock! This is classic Aurora Lacquer finish! She takes lots of flakies and turns them into a seamless polish. The flakes are both peacock-colored but also New Orleans-colored. I like to wait in between coats for these polishes as they are thicker. So much sparkle and dimension. Play Something, Axe Man! : 3 coats. Thoughts: The polish is a grape purple with red to green Aurora shimmer and iridescent flakes that shift the same colors. All the shimmers make the base color transform from a blurple to a purple. I took way too many pictures because I kept seeing different colors! This polish is beyond shifty. The (Night) Life of the Party: 3 coats. 2 had slight VNL. Inspiration: inspired by the bright lights and nightlife of New Orleans. Thoughts: A blackened indigo base with a shifting pink-red-orange-gold (at extreme angles) shimmer, holographic flakes and shifting gold-orange-green flakes. This finish is gorgeous. The holo flakes make this sparkle like nothing else and then the flakes. My mouth dropped when I put it on. I adore these finishes. I totally see bright lights and nightlife in this polish. Lady of the Dead: 2 coats. Thoughts: A thermal polish that transitions from black to colorless. Overflowing with shifting flakes, holo flakes, and some holo shimmer. I just have to say that thermals typically hate me, but I very easily had a nice transition with this polish! No water dunking. The colorless thermal sort of has a grey feel. The black thermal sort of has a purple-ish tinge in the sun! The iridescent flakes add a nice glow to the polish. This is very much a lady of the dead color! It was cold outside, so you can see my nails are starting to turn black! La Lavende Bayou: 3 coats. Thoughts: A pale lavender with red to green shimmer and holographic flakies. Wow this is so delicate and beautiful. The holographic flakes really make this polish POP! It takes it up another level. I think the amount of lavender that appears depends on your skin tone. You can see it's a bit more pink on me, but either way, the color is gorgeous. Bourbon Street Stroll: 2 coats. The inner nails were magnetized on the second coat. Inspiration: Walking down Bourbon Street! Thoughts: This is a deep purple with a red-gold-green magnetic pull, and green-purple shimmer. I wanted to leave the outer nails un-magnetized so you could see how gorgeous this color is on its own! The magnet allows for a shifting shimmer to pop! You can see it go from pink to green in the various lighting! I adore the complex shimmer in this. Second Line Shuffle: 2 coats. 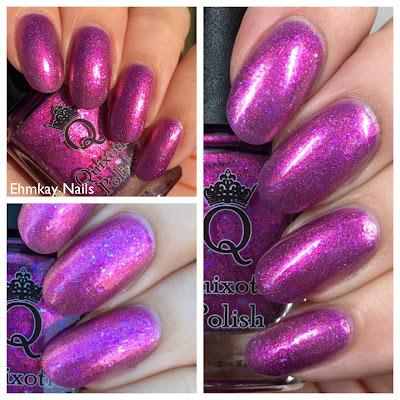 Thoughts: A violet-based holo with a purple pink shift. This is a glowing rich blurple and it's really an in your face holo with a super strong shimmer! Inspiration: Inspired by the many masks worn during Mardi Gras. Thoughts: A grey crelly base with a multitude of rainbow flakies. Love that there's another crelly! This one is more rainbowy and I can totally see how the flakes are reminiscent of all the colors in the masks! Again, for flake crellies, I prefer thinner coats so I can let the flakes shine. A Masked Affair: 3 coats plus top coat. Thoughts: This is a white crelly filled with green-to-purple-blue UCC flakies and a pinch of copper sparkle. The shimmer is much more obvious in person but it hid for the cameras. I love that a Mardi Gras-colored crelly made it into the line up. I can't wait to whip this out for Mardi Gras next month! I prefer to do thin coats when it comes to crellies, so I did three thin coats. Inspiration: Roux. Dark rouxs are used in Cajun cooking, and thicken up stews! Thoughts: This is a muddy cantaloupe-y coral with mauve/orange shift, rainbow micro flakes, gold holo glitter and ice blue glitter for contrast. Such a unique polish! I love this coloring of the orange. The maker's description of cantaloupe coral is PERFECT. Ruby Slipper: 3 coats plus top coat. Two coats had slight VNL. Inspiration: The famous Ruby Slipper cafe. Thoughts: A rich ruby red jelly packed with metallic and holo red glitters. WOW this is full on sparkle! It ends up being a little textured but nothing one coat of top coat couldn't fix. I think of Dorothy's shoes when I wear this. It's very sparkly and the jelly adds to the dimension of the polish. Thoughts: A lilac color shifting shimmer with micro holo flakes and delicate glowing blue flakes. Oh my goodness, this is pretty. The shimmer with the lilac create a super glowy color that's really stunning. The blue flakes add to this glowy feeling. 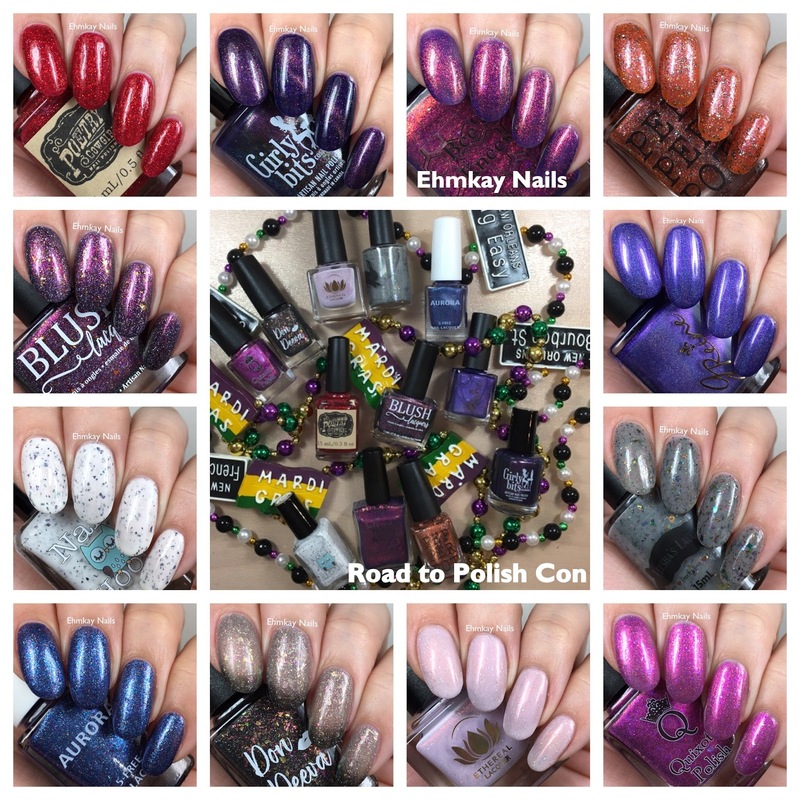 The Road to Polish Con series for part B will run from February 22-March 10. Orders will be shipped by March 22. You can shop the Road to Polish Con HERE. There will even be international shipping! Tickets are on sale NOW and you can purchase them HERE. There's a variety of levels of tickets, so choose the one that fits you! Such gorgeous colors! Especially those purples. There are lots of purples in this group, but that’s a quintessentially New Orleans color!! Gosh there are so many good ones in this group! Thanks for the update on when they go on sale - I know a lot of people have been asking! I made it red this time so people really see it haha. They are so many gorgeous offerings! That GB magnetic is gorgeous. I am totally confused when the KBShimmer I bought will ship, I have not been paying much attention to PolishCon since I’m not able to go, I’ll have to check you group A post! All shipping info is always at the end of my post. Both RTPC are a preorder so you will wait about 3 weeks after the end of the sales. all those reds and purples are speaking to me! Gorgeous! I'm a fan of the blues and purples. These really are fantastic. Oooh, there are some winners in this group! Great swatches! I'm obsessed with that shift on the Axe Man! So pretty and sparkly! So many purples, which is my fav color for polish right now!!!! Wow I loooove the big chunky glitter ones! I love Play Something, Axe Man!!! I am a huge fan of the American Horror Story so glad to see they pulled from in for New Orleans. That Bees Knees looks really pretty! These are all stunning but I especially love the purples. I will definitely get a bunch of these!